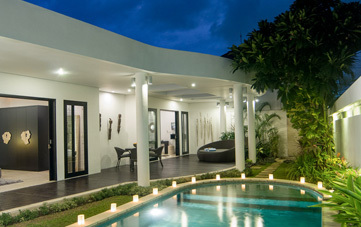 From $ 275AUD per night We have direct contracts with most villa owners. We don't add any booking fees. We are 100% transparent with no nasty surprises. 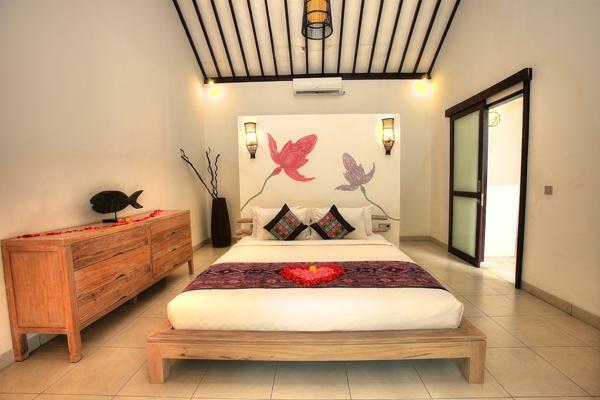 Budget viila in central Seminyak - rent this today! 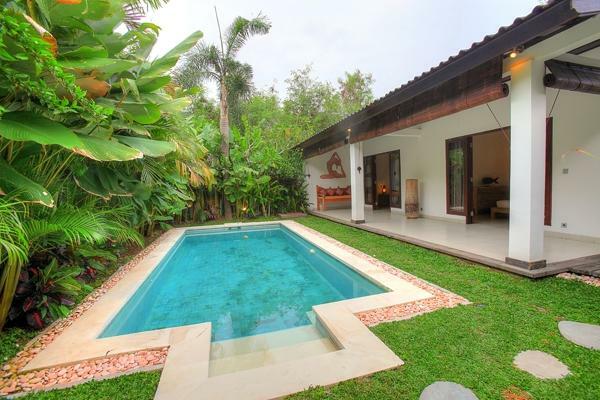 Villa Can Barca is in a great location right in the heart of the Petitenget / Seminyak area – close to all the really good restaurants, bars, cafes, nightlife, day spas and shops. 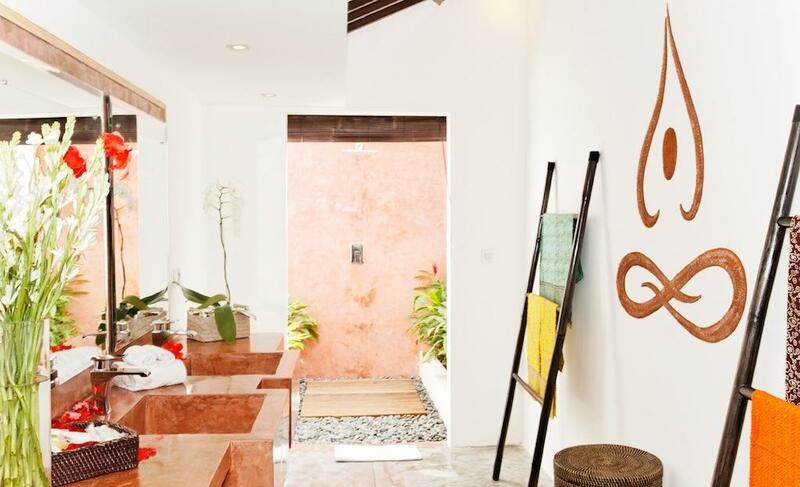 Villa Can Barca is a lovely 2 bedroom Seminyak villa holiday rental located in the equally fashionable and exciting Seminyak area. 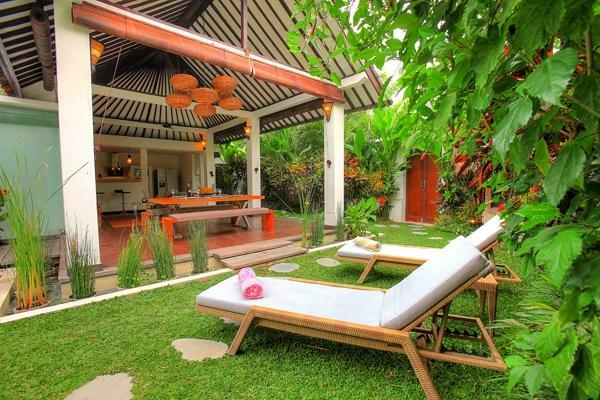 Seminyak is famous for its beaches, trendy cafes, bars, boutiques, yoga studios, gyms, health food bars and restaurants. 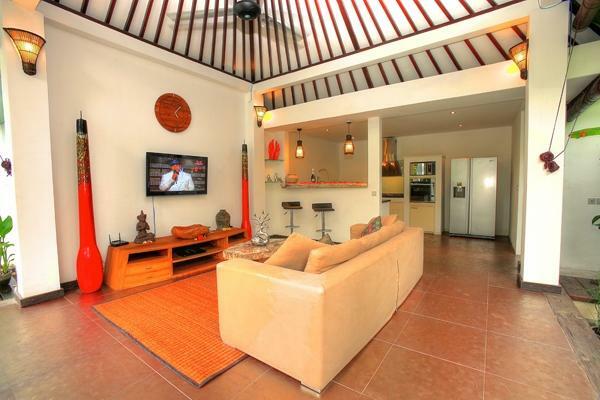 The villa is ideal for a small family or a group of four who wish to enjoy a relaxing and unforgettable holiday in Bali without spending a fortune on their villa accommodation. 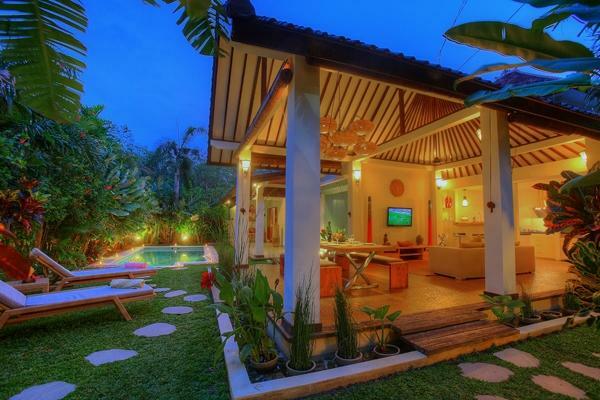 The exterior of Villa Can Barca is very family friendly. 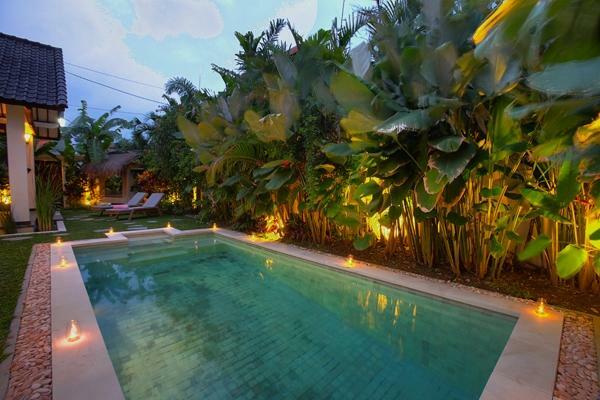 Lush lawns surround a spacious swimming pool and flanking the pool on one side are tropical plants and exotic flowers. 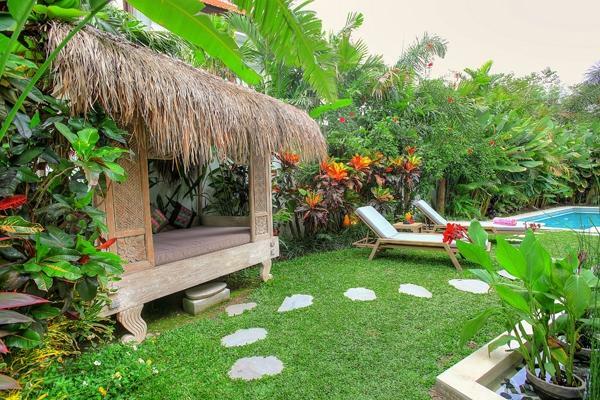 Tucked into a corner of the tropical garden is a traditional bale with a daybed and beside it on the lawn are two lounge chairs where guests can sprawl out and enjoy the lovely scenery and peaceful Balinese ambience. The open plan living room of Villa Can Barca can be found in an open sided building which is right beside the pool. 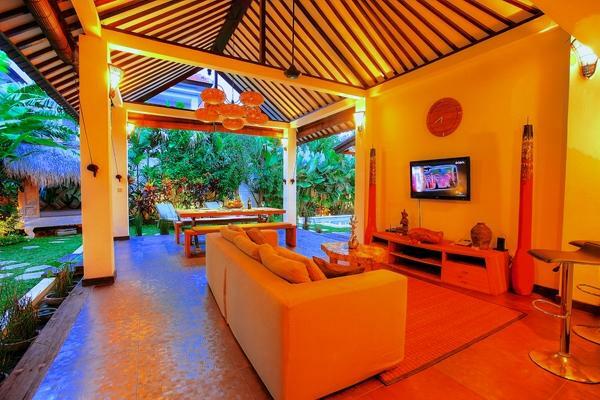 It has a vaulted wooden ceiling, tasteful Balinese décor and a lovely grey sofa which faces a wall mounted flat screen TV. Beside the sofa is a wooden dining set placed right on the edge of the building. 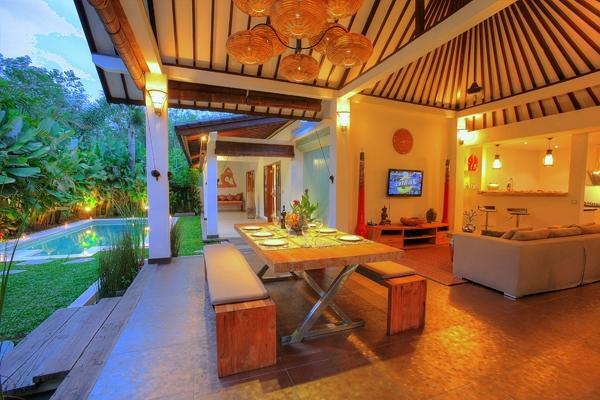 Guests can sit here and enjoy tasty meals with a lovely view of the garden and pool. 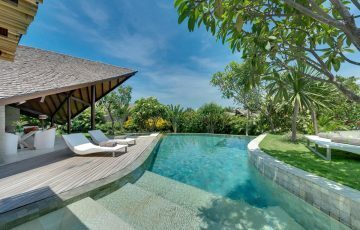 Villa Can Barca has two amazing bedrooms and in each one, there is a king bed, lovely wooden furniture, a study desk and table and a glass door that leads directly out to a patio overlooking the garden. 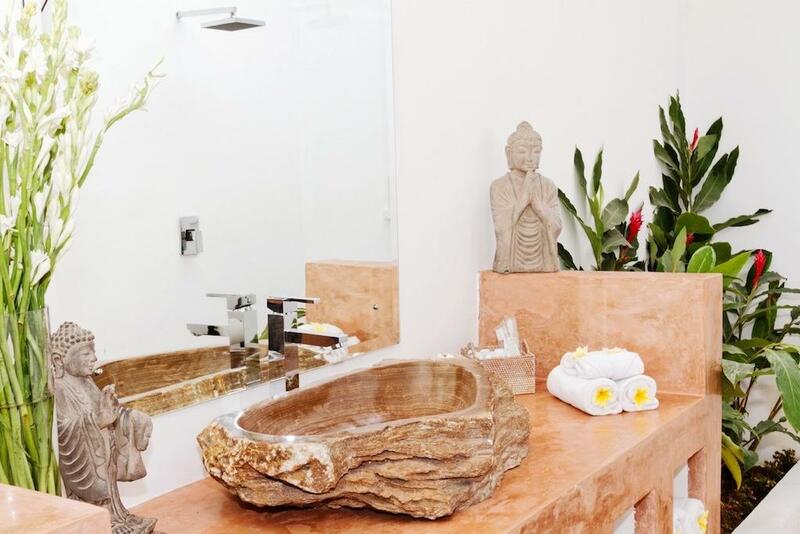 The décor is very beautiful and creates a very comfortable and relaxing space. 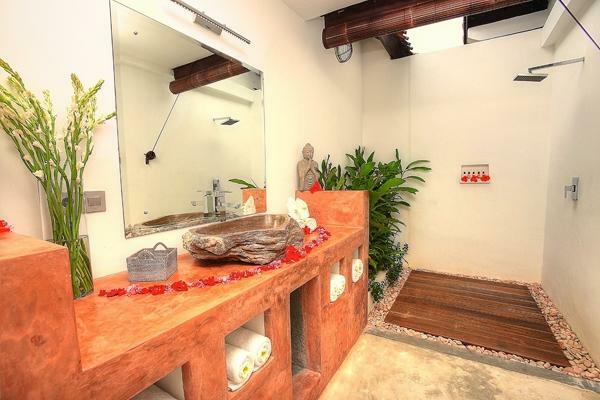 Each bedroom is ensuite and guests will definitely feel comfortable in them. 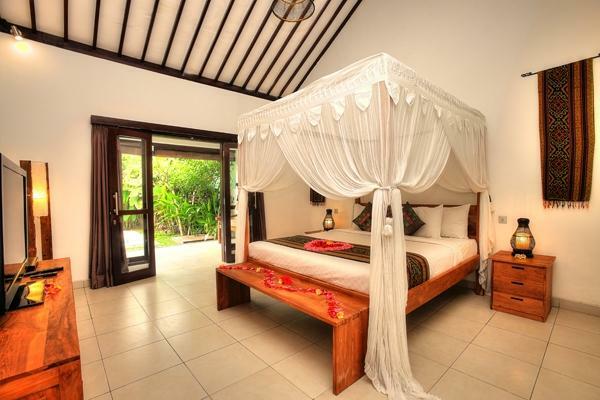 The villa is adequately staffed with well trained staff. 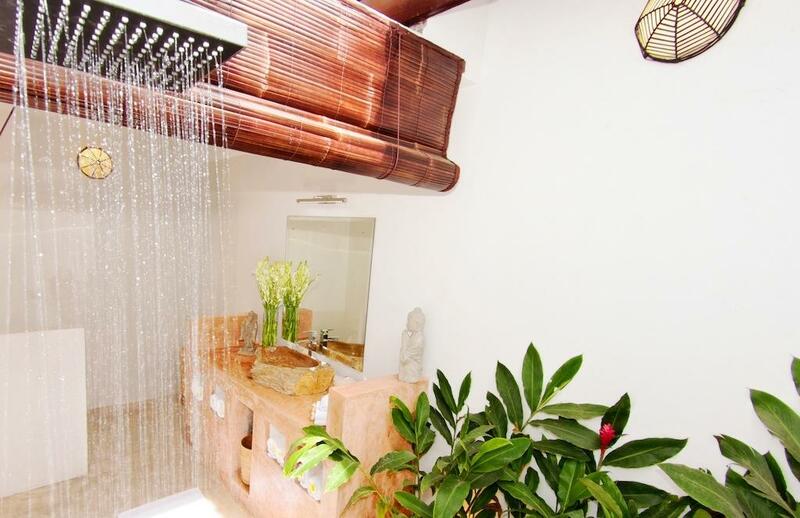 There is a daily cleaning service and guests can get in house spa treatments and massages for a small fee. The staff will ensure you are comfortable and taken care of throughout your stay. 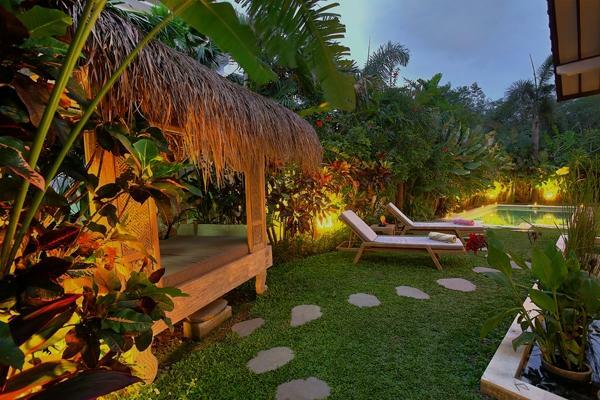 There is no shortage of things to do while at the villa as it is within proximity to the lovely Petitenget Beach and clubs such as Potato Head & Ku De Ta are only minutes away. 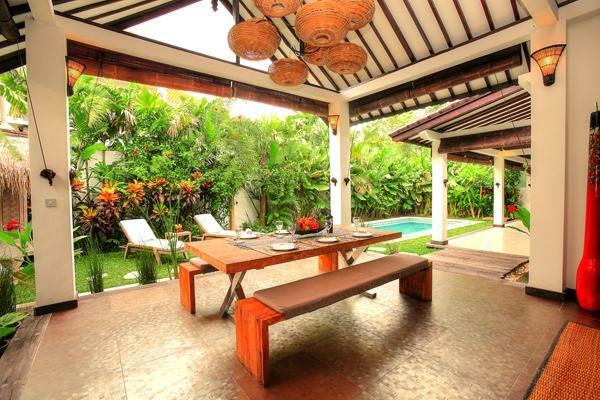 Plus you are very close to Seminyak Village and Square. 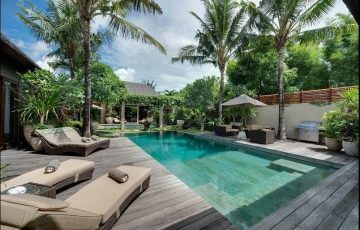 A perfect villa if your coming to Bali with kids as your also near the Finns Club which has a water slides, ten pin bowling and trampolines. 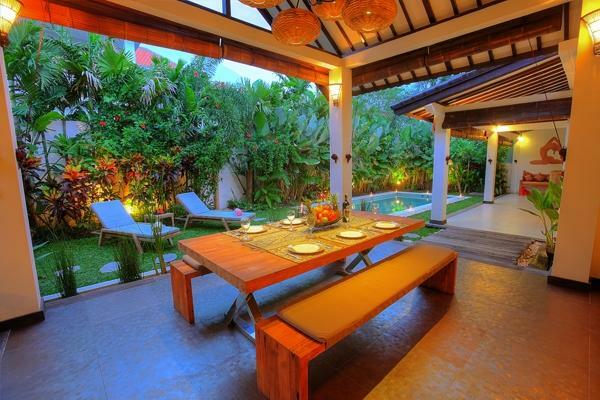 There are also loads of family friendly cafes and restaurants in central Seminyak to take the kids. Try Hanks Pizza, Sisterfields, Cornerhouse, Johnny Rockets & Man Frydays at Seminyak Square. 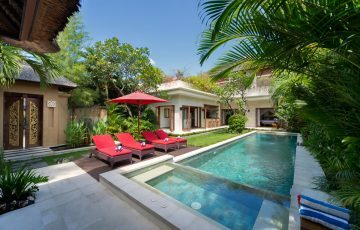 To view other Seminyak villas near Eat Street or our full range of family friendly Bali villas please browse this website or contact our reservation team. 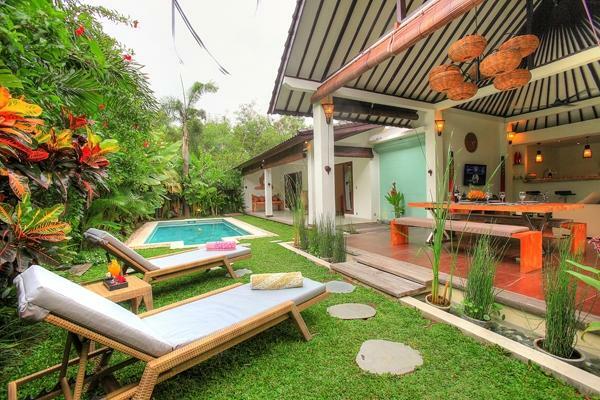 This is a popular Seminyak holiday villa rental so if your planning a trip to Bali, especially during the Australian school or public holidays please book Villa Can Barca well in advance. We spent 7 days here with another couple and loved every moment, especially the location. You could not get a better position for us as we are real foodies and loved going out to all those fabulous restaurants every night. I think we went to Naughty Nuris twice which was our favourite. 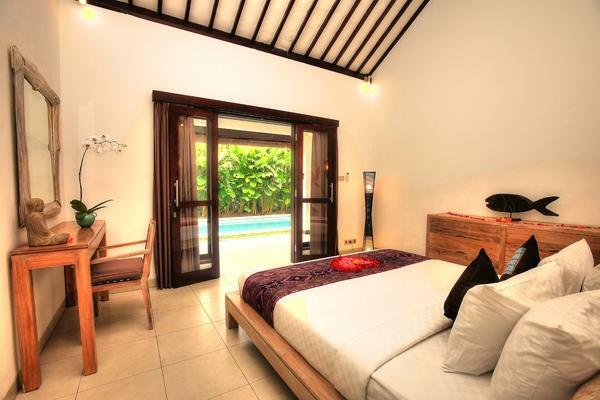 All the rooms were clean, modern and very spacious and we loved chilling out by the pool between shopping trips to Seminyak. 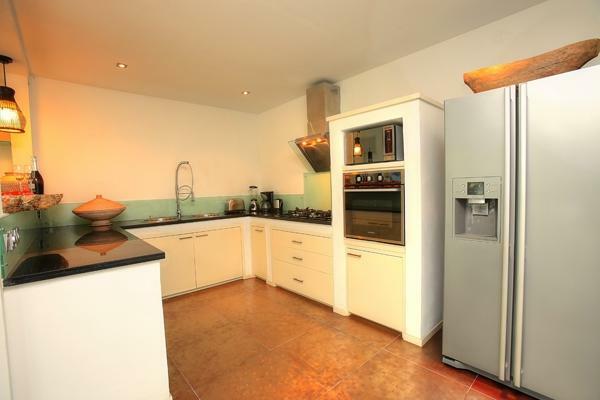 For the price and prime really central location this was really good value. We always used to stay in a hotel and this was our first try in a villa - this was a great decision and we will most certainly be coming back again. 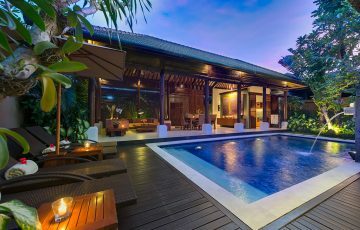 We would definitely recommend Villa Can Barca to anyone wanting to be in a great location and not spend an absolute fortune on their villa accommodation. 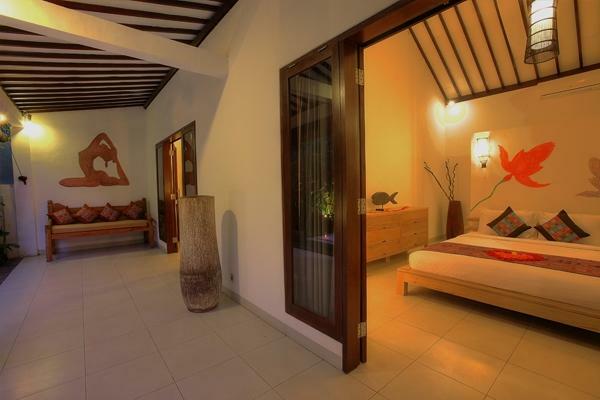 As far as the villa was concerned, the 2 bedrooms were all very clean, modern and quiet. The villa manager and staff ensured we were all looked after and were there to cook and clean daily. We loved the pool area which was always spotless and the kids were happy to play in the garden/pool while we read and basically did nothing except fully. Most afternoons we walked to the beach and watched the sunset and then made our way to one of the restaurants nearby. 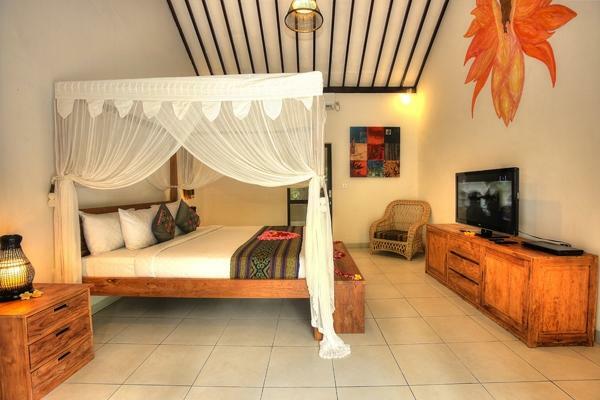 Definitely a great holiday experience without the big price tag. 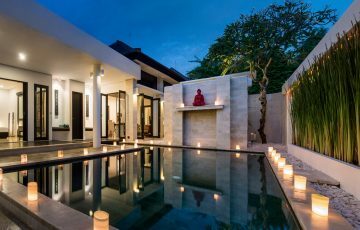 A huge thanks for Dewi at Bali Villa Escapes for organising all of this for us. Fabulous villa with lovely staff that made our stay a real treat. We felt very relaxed by the end of our stay and can't wait to get back here again next time we are in Bali. 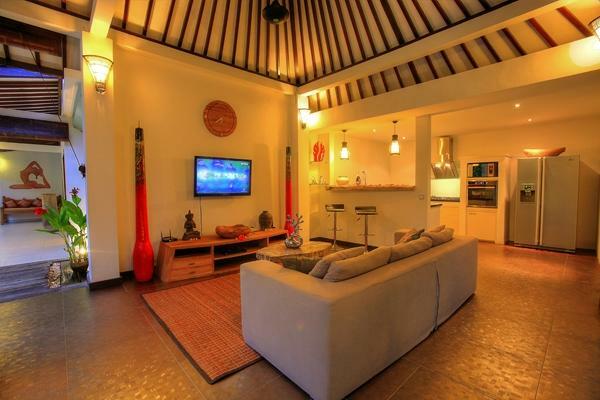 Great value, top location and very comfortable villa - it was like coming back home. For the facilities and location definitely try it. We really enjoyed Villa Can Barca. The location was great and the Villa just lovely and relaxing. Ida looked after the Villa every day and did a great job plus we really enjoyed her company. Booking through Lala was easy and responsive plus Christos who managed the property was on hand to help with anything. 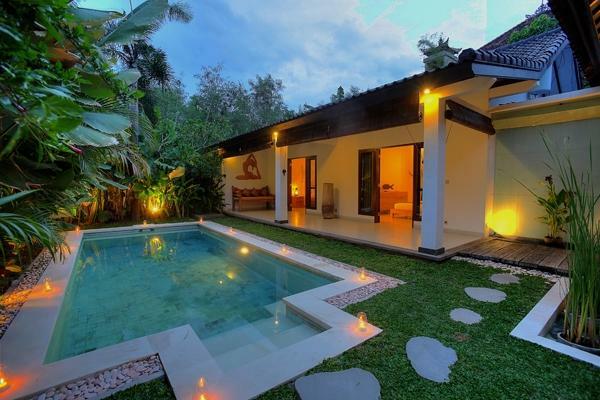 We’d love to stay in this Villa again.